Despite modern medical advances, the effects of traumatic brain injuries (TBI) on individuals and their families remain devastating. Many of us don’t realize that many serious brain injuries occur as the result of everyday activities, like a simple fall or sports injury. 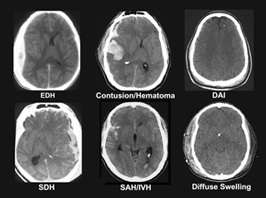 Complicating matters is the fact that the conditions of a traumatic brain injury can take time to manifest themselves as recognizable symptoms. Traumatic brain injuries are usually the result of a sudden, hard blow to the head. In Georgia, where football is a way of life, these type of collisions are quite commonplace for athletes, whether they play high school, college or NFL Football. Despite the public’s greater awareness of the risks of concussions that lead to traumatic brain injury in professional sports, there’s no sign of the trend reversing any time soon. The fragility of the human skull and brain means that even if seemingly mild concussions are not treated properly, there is a risk of traumatic brain injury-related problems later in life, including memory loss and, potentially, dementia or Alzheimer’s disease. Many NFL athletes are finding this out the hard way as studies continue to further illustrate the correlation between head injury and an increased risk for Alzheimer’s in senior years. Maybe you’re not a professional athlete or a person who is active in high-risk sports. Even those with less physical lifestyles should be aware of the possibility of a traumatic brain injury after a spill or fall. The safest course is to seek medical attention immediately after any head injury to ensure it is not serious. For those who do find themselves battling back after the terrible event of a TBI, the best and most effective route to take is to consult professionals with relevant experience and knowledge on the matter. If you or a loved one has suffered a traumatic brain injury, having talented legal advice in your corner can help make it manageable for the future. Before doing anything regarding the legal ramifications of any TBI, be sure to consult a professional traumatic brain injury lawyer, such as Bruce A. Hagen. We offer a fee-free exploratory process. That means that if no funds are recovered on your behalf, you pay nothing. Don’t take on TBI by yourself. Contact Bruce today for a consultation.